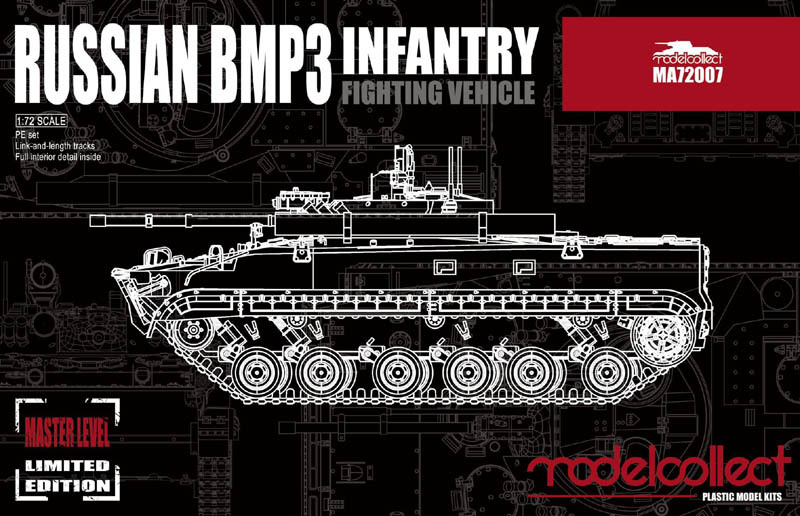 The main element of this kit is the BMP3, naturally, which is a Russian infantry fighting vehicle that has been in service (through numerous variants) since 1987. It looks to be an impressive kit, with a very large number of pieces, and includes a lot of interior detail too. However, as always, we will ignore the kit and concentrate on the generous number of figures that come with it, which are pictured above. Three of the figures in our top row form the three-man crew. First is the driver, sitting and with arms reaching to control the vehicle, which is well done because he is a single piece, with no separate arms or legs. He is nicely sculpted, with good detail and a natural pose. He wears the normal Russian padded cloth tankers helmet and standard uniform, so although he might be difficult to see on the finished model, his inclusion is well worthwhile and a nice touch. Next is a crewman also seated, but with both hands on his knees and in a relaxed position. This figure wears a soft peaked cap rather than the tanker's helmet, and while he too is nicely sculpted the left side of his face has suffered somewhat. The third crewman is the figure at the end of the row standing and pointing. Dressed the same as the driver, he is intended to be standing in the turret, which is why he has no base. 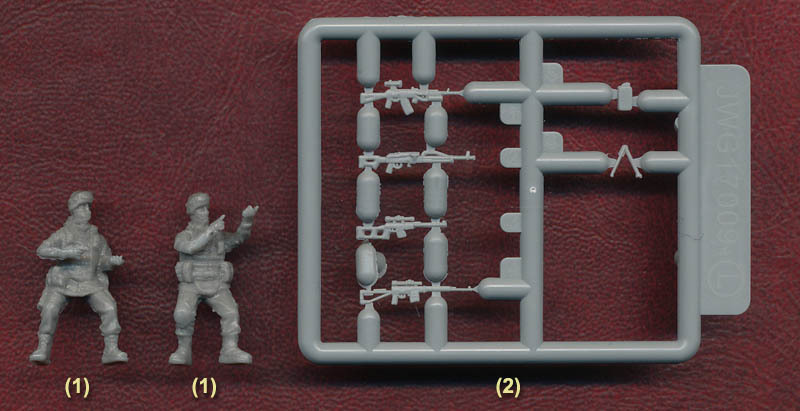 The based figure in the top row is an infantry soldier, as are the rest of the figures here. They are intended to be deployed in or around the vehicle, and come in a variety of poses. Many fulfil duel roles of either sitting inside the vehicle or perhaps crouching while on or near to it. Again all the figures come as a single piece, yet we were impressed with how very lifelike and active the poses are. The style is very much that of Caesar, and like Caesar figures some here clearly benefit from more sophisticated moulds that mean complex poses are possible without excess plastic in difficult places. The result is really good, and is particularly effective at portraying men clambering in and around such a vehicle, where figures with straight backs and flat poses would look especially inappropriate. Detail is very good, although some have rather disfigured faces that are very long and just look bad. The only other down side is that those poses which could be standing have no base, so perhaps are intended to be shown in or on the vehicle. Like the rest of the kit, these weapons are really well done and very clear, so should delight those with an interest in the current Russian military arsenal. So that is about it. The dog is another nice little bonus, although the clever mould has not been used here so there is some plastic between its legs, but as these are very thin anyway perhaps that is a good thing. As figures clambering over and into the vehicle these are perfect, and apart from the somewhat strange faces they are really well made too, having no flash whatsoever. With plenty of applications other than in decorating the BMP, these are a nice addition to the hobby and the most modern Russians so far made in 1/72 scale as at the time of writing.